If you trap a bobcat that looks like a cross between a lynx and a bobcat, we would like to know about it. We have recovered several lynx-bobcat hybrids in north central Maine and are interesting in documenting other specimens. Remember, if you are uncertain whether you have trapped a lynx or a bobcat please call a biologist or warden before dispatching the animal. If you have already dispatched the animal, and think it has unusual characteristics for a bobcat, we are still interested in seeing it. Please let us know about any animals you encounter that are wolf-like in appearance. Large coyotes (50 + pounds) are very rare. Any canid 50 pounds or greater may be a wolf, wolf-hybrid, or domestic dog. (See Comparison of wolf, coyote, and dog tracks.) 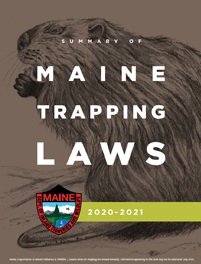 Maine law protects all wildlife from hunting or trapping when there is not a specific hunting or trapping season for the species. It is also illegal to indiscriminately shoot domestic dogs or wolf-hybrids. We have documented several wolves and wolf hybrids over the last 20 years. In most cases, we believe these animals were released from captivity. However, we also know that wild wolves have been trapped in southern Quebec and it would have been possible for these animals to travel into Maine. Wolves are considered a federally endangered animal in the Northeast and it is illegal to kill them. Please use care in identifying any large canids you encounter. If you suspect you have a canine in a trap that is over 4.5 ft. in length (from tip of tale to nose) or over 50 pounds it may be a wolf. Please contact your regional biologist before dispatching the animal. If you see tracks, hear howling, or find other sign that indicates that a wolf is nearby, please contact our Department. Wolves of the Laurentides Reserve of Quebec (the nearest established wolf population to Maine) range from 55 - 105 pounds. Wolves have proportionately longer legs, frame, and larger feet than coyotes. Compared to coyote tracks, wolf tracks are larger and rounder. 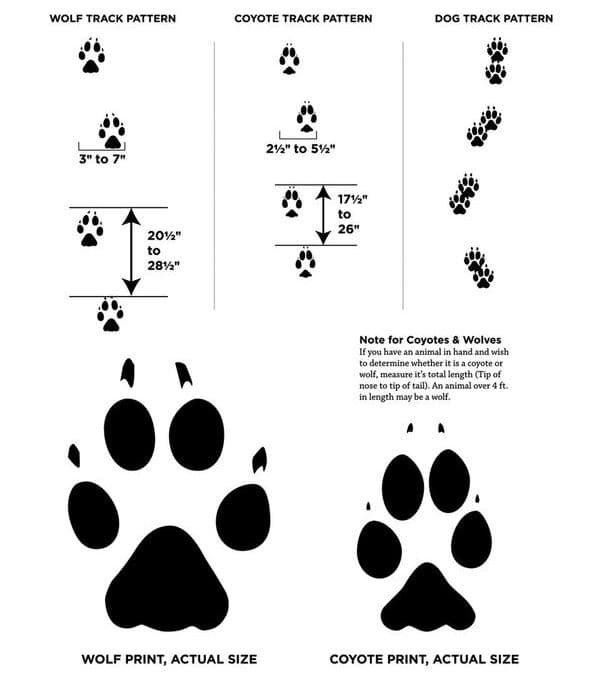 (See Comparison of wolf, coyote, and dog tracks. )Wolf coloration ranges from black to very light beige. Many wolves are tan with grizzled black and gray - similar to Maine's coyotes. Bobcat General round appearance. Heel points in slightly different direction than toes. No nail marks, but if present, attached to toe marks. 6" to 14"
Length - 1⅞" to 2 �"
Width - 1⅞" to 2 5/8"
Direct or double register walking pattern. Trail pattern zigzags right-left-right-left. Lynx Same as bobcat but tracks show a lot more hair. Smaller pads than a cougar. 11" to 18"
Length - 3 �" to 3 �"
Width - 3" to 3⅜"
Length - 4 �" to 5⅜"
Width - 3⅜" to 5 �"
Cougar Same as bobcat 20" to 32"
Length - 3" to 4 �"
Width - 3⅛" to 39/16" Walking pattern similar to other cats. Deep snow may show belly and tail drag marks. Coyote 4 toes, oval shaped track, Front nails often close together. Side nails often do not register. Length - 2⅞" to 3 �"
Width - 1⅞" - 2 �"
Dog Similar to wolves and coyotes. Inner toes often splayed outwards. Varies with breed Varies with breed Trail pattern sloppy, wandering, not usually in a straight line. Walking pattern is often double register. Wolf 4 toes, symmetrical track, longer than wide, more rounded than a coyote, nail marks not attached to toe mark (same as coyote), 4 nails register. 20 �" to 28 �"
Length - 4" - 4 �"
Width - 2 �" - 3 �"
Length - 3⅞" - 5 �"
Width - 2⅜ - 5"
Trail pattern usually is in a straight line. Walking pattern is usually direct registering. Comparison of wolf, coyote, and dog tracks. Illustrations follow those in Rezendes (1992). 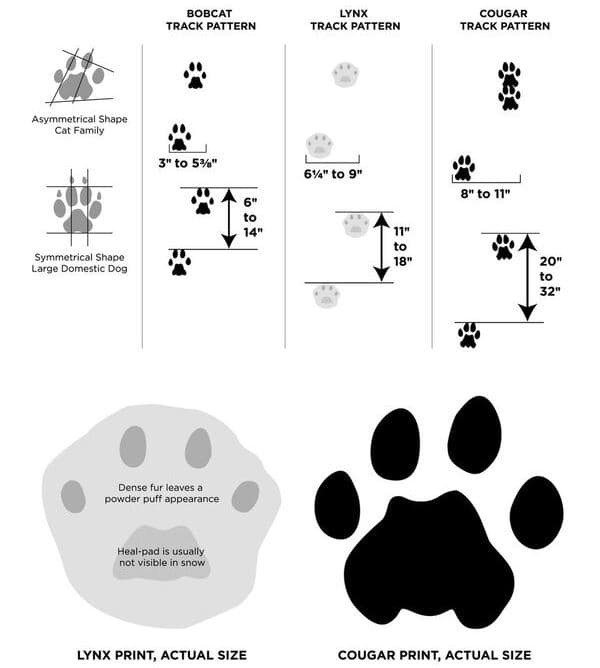 Comparisons of canine and cat tracks, and bobcat, lynx, and cougar tracks. Illustrations follow those in Rezendes (1992) and Elbroch (2003).